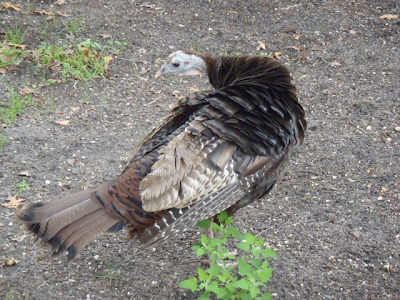 I considered this a little bit marginal, as this turkey is named (see wikipedia article here), hangs out in a downtown park, and has previously been captured and returned there. I suspect she also gets fed to encourage her to stay. But since she turned up of her own accord, and there's nothing to stop her moving on, I'll count it. Plus I've seen more than enough wild turkeys, so I don't feel like I'm cheating.